Today, those who leave graffiti as a reminder of their existence might use paint. Centuries ago, scratching laboriously into stone surfaces with hand made tools, native people left designs we call petroglyphs. 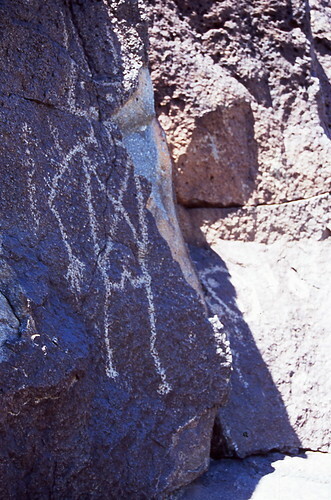 Scratched into the surface, Native Americans left behind images that can be easily figured out and some that are mysterious. Last week, I began a three part series on what to do when you’re not invited to the same seminar as your wife in Santa Fe, New Mexico. Hopping in the car with a bag of chips and an assortment of “beverages of my choice,” I headed north out of the city on US 285/84 until reaching NM 502 and then west to NM 4. The first stop was the cliffside dwellings of Bandelier National Monument. This week, I am leaving Bandelier for a short drive to Los Alamos. As you pull out of the park entrance, a left will put you west on NM 4, then north on NM 501 will put you at the west end of the town of Los Alamos. Rose Big Horse was asked to demonstrate her weaving skills at the Wupatki National Monument in Arizona recently. 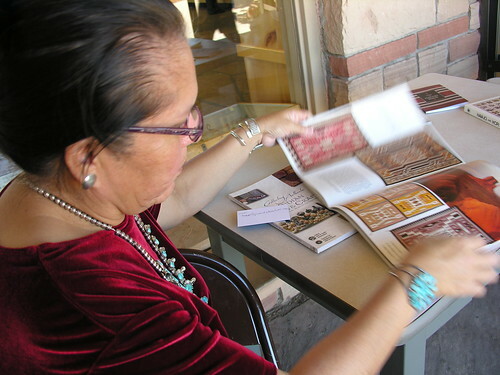 Her efforts and designs are part of a long tradition in her Navajo Tribal family. 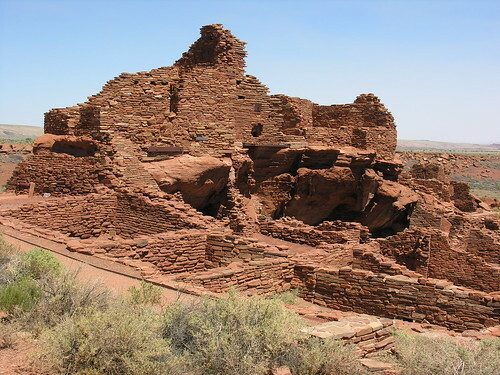 Passing Sunset Crater Volcano National Monument (see last week – August 17), travel through a landscape of scrub brush and lava rock and you reach Wupatki National Monument. When we visited Walnut Canyon National Monument this past weekend, we were alerted that there were 240 steps down – and up – from the visitor center to the Loop Trail where we could see the homes of ancient people carved out of steep hillsides. 240 steps – each way, up and down – was quite a strenuous trip to reach the top! When Sinagua people inhabited the cliff dwellings of Walnut Canyon 800 years ago, they must have been part mountain goat – and they didn’t have paved steps and paths! Although I consider myself fairly physically fit, the altitude, 7,000 feet, coupled with the demanding climb of 185 feet, I reached the visitor center panting with my heart pounding. The KOA Campgrounds across the country are usually very nice and well run. One of the nicest is the one in Las Cruces, NM. There are trees and a cement pad at every site and most are pull-thru, making it easier to get your rig in and out. The Las Cruces campground has a wonderful pool and picnic/barbeque area, and a grassy area for those with tents. The general store and gift shop offers western and native wares for purchase, along with restocking your rig. What to do when the wife is in a conference in Santa Fe? Abscond with the rental car and take a little trip around northern New Mexico, that’s what! It was sort of a last minute idea, so I looked at a map to see what I could do in a day. Two towns, and a national monument sounded feasible, so I dropped her off and I headed out.